Although golf may not be the first thing that comes to mind when you think of Fiji, you may be surprised to learn that Fiji is in fact a golfer's paradise. With ladies and mens Championship Opens held in May and June, you can coincide your visit with a chance to see all the action or simply enjoy the excellent Fiji golfing year round. The island's spectacular scenery, tropical climate, laidback lifestyle and beautiful resorts offer the perfect conditions to work on your game and your tan. Whether you're an amateur or pro or just somewhere in the middle, there are heaps of places in Fiji to practice your swing. In fact, there a total of 13 golf courses in Fiji ranging from basic 9-hole courses all the way through to 18-hole championship courses with pars of 27 to 72. Some of the most popular golf courses in Fiji include the Denarau Golf and Racquet Club, Pacific Harbour Golf & Country Club, Natadola Bay Championship Golf Course and Nadi Airport Golf Club. There are also courses found at the Shangri-La's Fijian Resort, Taveuni Soqulu Plantation and The Naviti Resort. Many of these golf courses are attached to stunning hotels and resorts, ideal for those who are after the stay and play option. 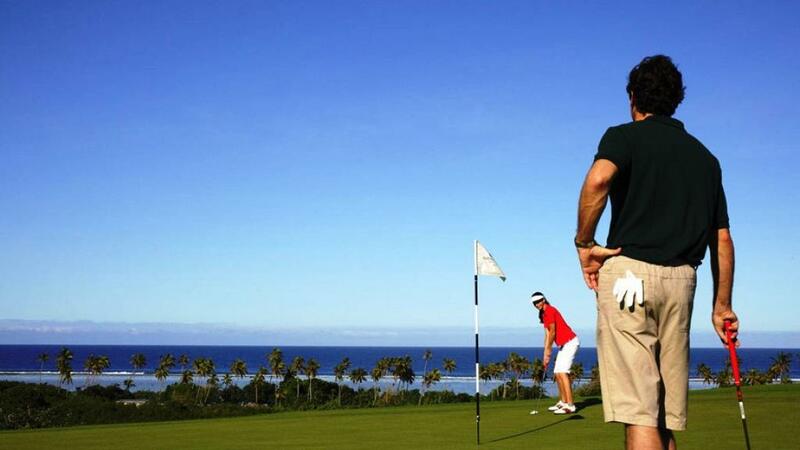 The golf course at the Sheraton Fiji Resort is the South Pacific's premier championship course where you may find yourself sharing the green with players you recognise. The Executive Golf Course at the Novotel Hotel Nadi is a steeply sloped course which offers a real challenge while the course at Shangri-La Fijian Resort boasts a double water hazard, Tifton Dwarf greens and plenty of sand traps. However perhaps the most spectacular golfing experience goes to the championship course of the Intercontinental Fiji Golf Resort and Spa allowing you to tee off right next to the ocean.